This was the best hostel I’ve ever stayed in! Very well, great facilities and staff. Highly recommend! Great atmosphere, good prices and amazing stuff who are always there for you if you need something! 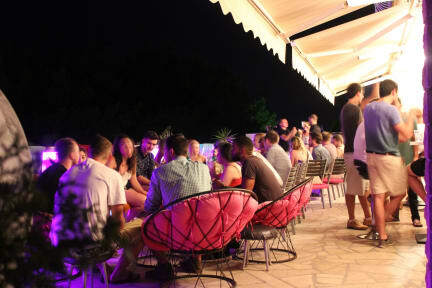 Loved the happy hour which bar offers and hanging out on the terrace with other guests :) Also it's really close to one of the most beautiful beaches that I've seen in Croatia (can't remember the name lol). Only downside is that it's located up on the hill so walking there 3 or 4 times a day can be annoying. Otherwise, great place to stay! This hostel is such good value for money! I have to admit it is a bit hard to get to with luggage but once you don’t have a bag weighing you down it’s fine. The terrace is a massive bonus-perfect place to chill, I was with a group here but I’m sure it would have been easy to meet people. Rooms are comfy-air conditioning is COLD. But my bunk didn’t have a power point or private light, plus the lockers are tiny. But this place is so cheap and clean and everyone is lovely. Book it!!! Best hostel ever! Run by really nice people! They organise a meeting at their terrace for the inmates, to socialize and take u for a pub crawl! Best time ever!!! The vibe of the place is amazing! Really nice, affordable hostel with great location, the staff gave us ice cream when we arrived which was super cute! the hostel is just a short walk away from a beautiful little beach, its uphill so getting back is a little bit a a hike but not too far from anywhere, including the main part of town. The outdoor area with the bar was really nice and the pub crawl they organised was fun! The location was good (it's a 10-15 minutes walk to the town center but close to nice beaches), really nice and spacious rooms with big lockers and curtains in front of each bed, A/C was really good to have! Staff was marvellous and eager to help with anything. The balcony is awesome (great views) and there's even a pool. There were many solo travelers and it was easy to connect on the balcony and the pub crawl that's held every evening. Also, the hostel and its facilities are very clean. Had a wonderful stay for a couple of nights. Very well perched on top of the beach.